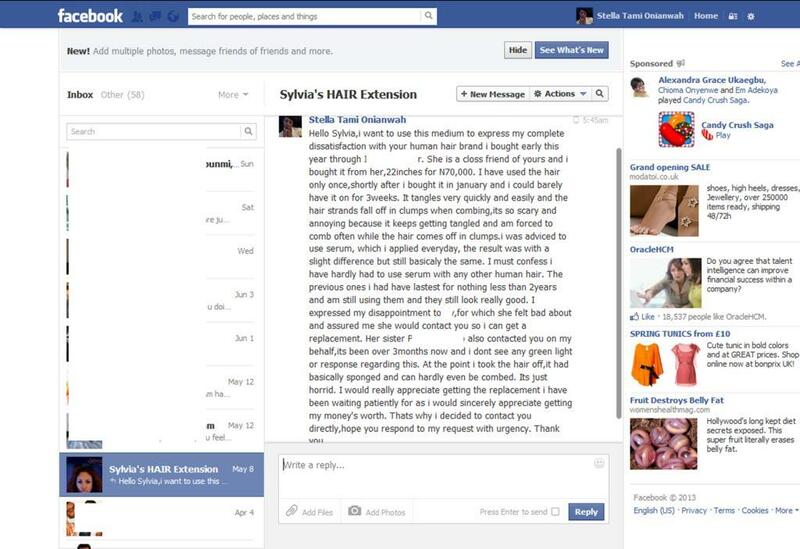 Ex-MBGN, Sylvia Nduka's line of 100% Human Hair is FAKE! "Sylvia's Hair is a Fake"
This post should serve as a warning to all you human hair lovers. Between 2011 and 2013, I can't count the number of Human Hair brands that have come into Lagos state. Fortunately for me, I do not use weaves or else I am certain I would have been utterly confused. A friend used Sylvia's human hair, and i liked it when i saw it on her and so decided to order same for myself. I bought lengths of 22 inches which was worth N70,000 in total. I fixed it for the first time to attend a friend's wedding and it looked really great, but after the first day, combing it subsequently became an ordeal. It tangled a lot and every time i combed it, it came off in clumps. I usually have human hair on for at least 6 weeks,but in this instance, i could barely have it on for 3 weeks. Eventually when i took it off after a month, it had become spongy and i could hardly comb it at all. Other human hair brands I have used are still in very good condition even after using them for 2 years. I have used Sylvia's hair for only 1 MONTH and my money has gone down the drain. 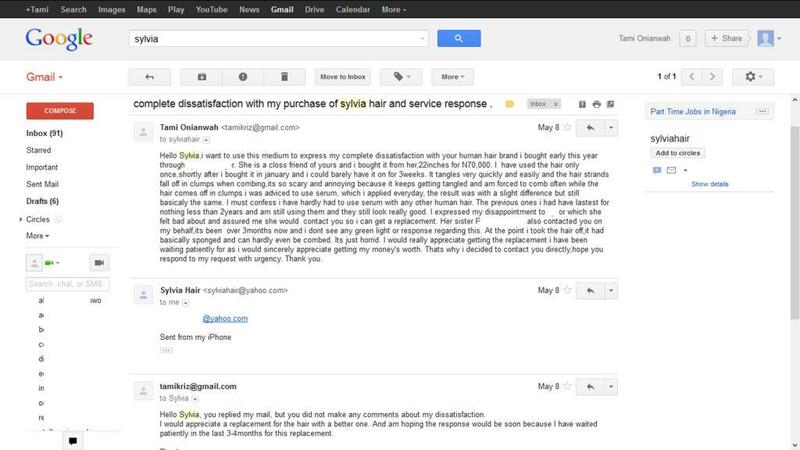 The saddest part of it is the manner with which complaints are treated by Sylvia. My friend had sent her messages letting her know about my complaints, while i waited patiently for 3-4 months hoping to get a feedback or response, but none came. but my complaint was treated with a snobbish non-response. I don't wish to have a replacement of the human hair anymore, all i want right now is my money back. Thanks Sylvia, it was really a great pleasure doing business with you. Wishing you all the very best in the upcoming Face of Sylvia's hair (FOSH) pageant. As a great believer in the brand building process, I am always of the opinion that customer satisfaction is key. Afterall, who are we without our customers, fans and supporters. An aggrieved customer is a lot of money lost in the bank eg. Jumia and I; Imagine all the lost naira that has left my hands to other online retailers who sell the same thing Jumia does? The same is true of all businesses and brand owners, especially when owned by well known individuals. So I say, do not fall into the trap of being the haughty business owner. Remember, you will be nowhere without those who patronise you, believe in you and support you all the way. I sure hope 'Sylvia's Hair' responds favourably to this post, but you can be sure that I will keep you all informed.